Synthetic substances like pharmaceuticals or plasticizers find their way into waste water and influence or even harm humans and the environment. The use of ozone is one method to destroy those contaminants, other ones are bacteria or viruses solved in water – however, all these methods afford high costs and a lot or energy, so they are not applicable in each case. Therefore, it was an aim of our development to provide an ozonation method for waste water that can save energy and resources to increase its applicability. This resulted in novel membrane reactors with special fluid distribution devices that allow a bubble-free immission of ozoniferous gases into the liquid phase. Moreover, this system allows to reuse the oxygen that remains within the gas phase after contacting the ozoniferous gas with the liquid phase. 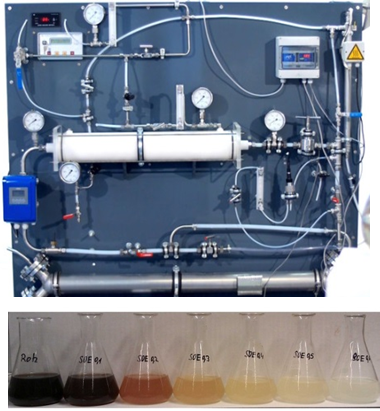 In contrast to conventional ozone reactors that are currently used for the ozonation of drinking water, of process water and of waste water, the novel systems can reduce space requirements and operational costs. Moreover, it allows to treat waste waters that tend to strong foaming without any problems.